Every holiday season, glossy brochures from Heifer International arrive in US mailboxes tempting people to send the gift of live animals to people in poor countries. Photos show happy kids hugging happy animals and assure givers the animals will provide meat, milk, eggs and wool in perpetuity. Wrong. A few years ago, two teachers who visited communities in Honduras that received Heifer animals saw the problems first hand. A “disease killed off all the chickens in a particular village,” said one teacher in the Daily Citizen. Children were so worried about their animals being stolen they were sleeping with them, another teacher told the Reno Gazette Journal. To dispel worries about what happens to the animals after they are shipped, a 2008 Heifer International newsletter addresses well-being questions head on. But the answers are unsatisfying. How do poor families feed the animals when they don’t have food themselves? If they can’t “grow enough feed” says the newsletter, “families are taught the best substitutes to buy locally.” Buy? What happens when animals get sick? Families can use “local natural substances that are known to provide specific medicinal benefit,” says Heifer. Will they “buy” them too? 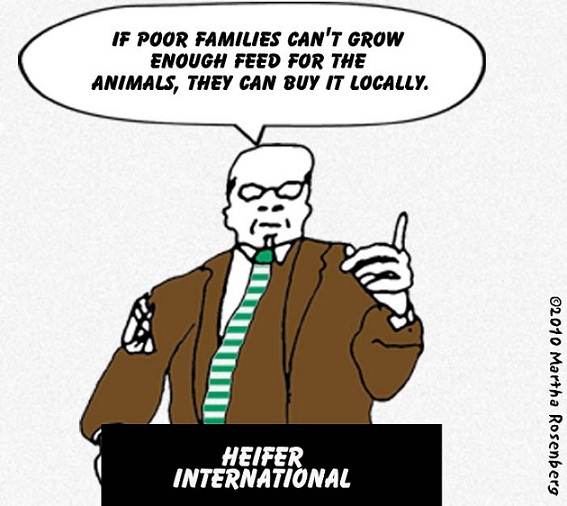 Using animals as antipoverty commodities is so ill conceived, even Heifer International projects in the US have killed animals. The charity set up an aquaculture project in subsidized housing in Chicago to enable poor kids to sell fish to restaurants for money. In 1999 all the fish froze to death when the heat and power was cut to the building, some say deliberately. Two year later, all the fish died again–this time of heat when power went off during a storm, some leaping “out of their barrels trying to escape accumulating ammonia and rising temperatures,” according to the Chicago Tribune. Former Indian minister for social welfare and animal protection Maneka Gandhi, is no fan of live animal donations. “These charities woo the ethical shopper with pictures of goats wearing Christmas hats and promises of helping the poor in developing countries,” but within two years the communities “have an even poorer lifestyle,” she says. Clearly, the way to help the cute children and animals in the Heifer International catalogues is to make a donation to a charity that doesn’t ship live animals. This article was posted on Friday, December 21st, 2012 at 8:00am and is filed under Life/Animal Rights.